Qamaruddin & Associates are both soldiers and scholars of law. Qamaruddin & Associates is a firm comprising of professionals with diverse experience of about half a century in the field of law. Various milestones have been traversed by us as we continue to hold by our pledge to serve with sincerity, integrity, dedication and above all a passion to excel. The cornerstone of our commitment is providing superior legal services, which is upheld by our declaration to cherish and nurture a rapport with our clients by providing efficacious and expeditious legal services. We are located at New Delhi, which has emerged as a threshold to myriad opportunities, ideas and business interests in India. The Business District of the city, includes few satellite towns, is termed as the National Capital Territory is no less than a sea of prospects and opportunities. However, we are not confined to the limits of this city or the country but have spread ourselves beyond its shores. In fact it has been a fruitful partnership and a fulfilling journey with our clients and the same is the source of our inspiration to keep moving on. We believe that our experience and knowledge of law can come handy in innumerable ways. Our endeavor is to provide the most appropriate legal advice and for the same we continuously update ourselves in law and procedure so that our clients benefit the most in our association. 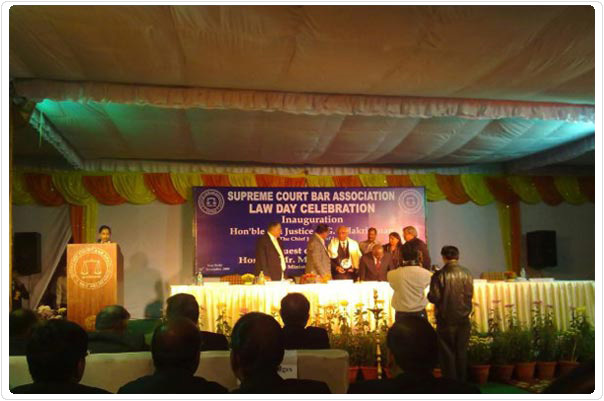 Mr. M. Qamaruddin being honoured by Hon’ble the Chief Justice of India and the Hon’ble Union Minister for Law and Justice upon completion of 50 years in the legal profession. © 2017 Qamaruddin & Associates - Advocates Supreme Court. All Rights Reserved. All the material posted on this site is for purpose of information only and should not be regarded or relied upon as legal advice. Any reliance on the information contained herein is solely at the user's own risk. Specific legal advice should always be obtained before acting upon any information or commentary provided on the site. Bar Council Regulations and the Advocates’ Act does not permit lawyers to advertise or solicit professional work in India, therefore, in compliance of the same this site contains restricted information.